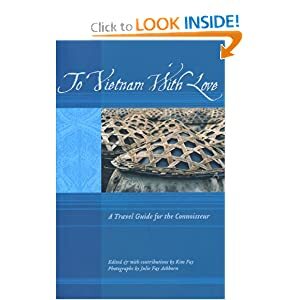 Born from the Southeast Asian guidebook that The International Herald Tribune's Thai Day hailed as a guide with depth and color that most of [its] competitors lack, To Vietnam With Love: A Travel Guide for the Connoisseur launches the To Asia With Love series. This beautiful, full-color guidebook features a collection of personal essays by savvy expatriates, seasoned travelers, and inspired locals. Each reflection on a favorite dining, shopping, sightseeing, or cultural experience is paired with a practical fact file, so that readers can follow in the writers footsteps. From staying overnight with a local hill tribe and climbing Southeast Asia's highest mountain, to touring historic French villas and getting involved with local charities, every recommendation captures a distinctive aspect of the country. Editor Kim Fay first traveled to Southeast Asia in 1991. Since then, she spent four years living in Vietnam and has traveled back frequently, writing about the region. She is the creator and series editor of the To Asia With Love guidebooks, and the author of Communion: A Culinary Journey Through Vietnam.